We are delighted to offer a new small group guided tour including Stonehenge, Burford, Oxford, Stow-on-the-Wold, Upper Slaughter, Lower Slaughter, Bibury – the most beautiful village in England. Guided tour of Bath, visit to beautiful villages of Lacock Village and Castle Combe. This is without question the best value tour available to this region, combining the Cotswolds, Bath and Stonehenge over a leisurely 2 days. 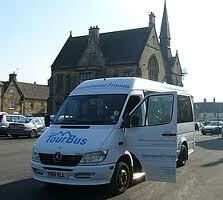 This tour is driven and guided by a friendly driver who is very familar with the area its many back-roads. This means that you will venture off the beaten track to see and enjoy some of the area’s most beautiful places. Your transport for this tour is in a spacious luxury 16 seat minibus with large windows and the ability to travel down some the narrow lanes which are not normally used by large coaches. We promise you a first-class experience and memories that you will treasure for many years! DAY 1 – After an early start we drive in a westerly direction, calling in at Oxford for a guided tour of the city. Next we travel a short distance to discover one of England’s most beautiful regions – the Cotswolds. The Cotswolds are full of colour all year round! Here you will find rolling hills and pretty villages and market towns full of character. Our journey this morning takes us to the historic market town of Stow-on-the-Wold. In the early afternoon, we drive along one of the most charming narrow back-road routes in the Cotswolds, where large coaches are not allowed to visit in what has been described as England’s most beautiful village – Bibury. This is in the heart of the Cotswolds and what we might consider to be the real England with its old country pubs, traditional village stores and well kept gardens. DAY 2 – Today we visit Bath where we take a guided tour of the city centre. At the end of the walking tour of the city, we include your entrance into the Roman Baths. Bath, which is one of England’s most popular tourist attractions. Bath is the most complete and best preserved Georgian city in Britain. The spa was used by the Romans, and the remains of the Roman baths are still there to be seen today, beside the 18th century Pump Room. After Bath, we travel to Lacock, a small 13th century village which remains mostly untouched by modern development. Then next we go to see another world famous site – Stonehenge. The construction of Stonehenge started around 3,000BC and the site was built over a 1500 year period. Your entrance fee to Stonehenge is included in the price. We return to London by mid evening.